A soldiers’ expectation when they were taken out of the line due to wounds or illness was to begin a journey that led to treatment. The BEF and CEF had a proscribed process that was designed to evaluate the condition of a soldier and make a determination as to the type and method of treatment, hence whether they stayed on the Continent (France) or were sent to England, better known in the vernacular as “Blighty”, for treatment. Ideally the intent was the efficient treatment and return to duty of a soldier and the further away the soldier got from the front the more serious his condition and the lower the likelihood of return to service. The problem for the military authorities was one of inventory. The need of active combat and support units to be manned by the correct numbers of soldiers and technicians (sappers, engineers) to support operations required a specified number of personnel. Low inventory led to operation inefficiency and effectiveness. This challenge throughout the war would lead to several operational changes and procedures and would never be completely solved due to the changing nature and tempo of the war, especially during The Last 100 Days. The problem for the soldier was one of treatment. But the main focus for the soldier while being sick or wounded was the feeling of relative safety they had as they were not in active operations at the front and the very thing that led to their wounding or illness had been removed from their environment and they could expect to be treated with care and dignity. The relative high efficiency of the medical services of the Imperial Forces (in which the CEF served) during the First World War was in direct response to the poor care given during the Boer Campaigns at the turn of that century. [i] Medical care was not just for the soldiers but also for the public and its perception of the treatment of their soldiers had a direct impact on their morale toward their support for the war. This journey started with a soldier being carried in a stretcher or walking to the field ambulance. From the FA to the CCS they would travel by horse-drawn or motorized ambulance. From the CCS there were often railheads established and the soldiers boarded specialized trains to hospitals in France or to a French Channel port for transport by hospital ship. It is here where our soldiers enter the picture. Private Percy Mungo Geddes, “…well known to the milling trade in Galt was on his way home after an attack of rheumatic fever,” which he contracted after two months of front-line service on November 11, 1915. Entering the medical support services of the Imperial forces, he was sent to No. 2 Canadian Stationary Hospital at Boulogne and boarded the H.M.H.S. Anglia on the morning of November 17, 1916 for England and further treatment. Galt Daily Reporter. November 29, 1915. Page 5. HE GAVE AID TO HELPLESS AND REFUES TO LEAVE BOAT TILL LAST MOMENT. GRAPHIC STORIES ARE TOLD BY SURVIVORS OF CHANNEL DISASTER. London, Nov. 29—Graphic stories of their peril when the hospital ship Anglia sunk in the Channel were told by eight Canadians visited by the Mail and Empire correspondent at the County of London Hospital, Epsom. They were mostly invalided or suffering from slight wounds, and therefore were in a position to help themselves, [and] a number of Canadian companions more seriously incapacitated have perished. H.M.H.S. 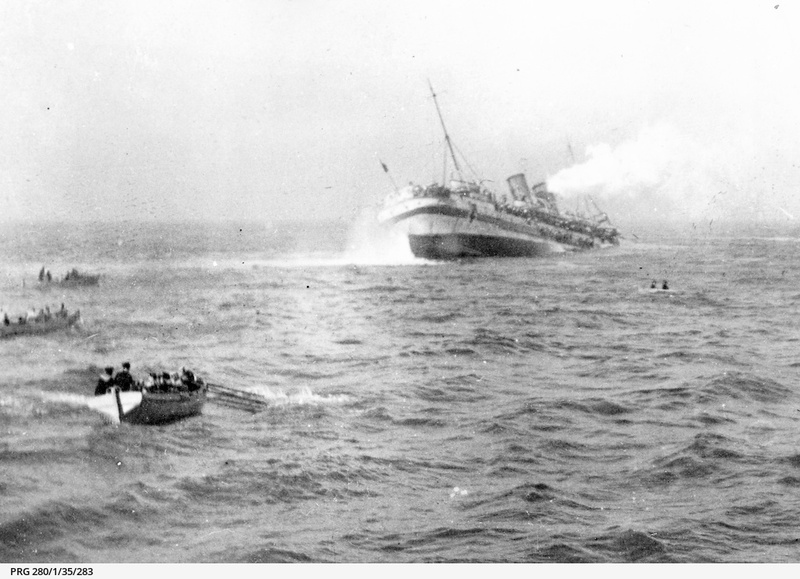 Anglia sinking. You can see it sinking by her head and she would sink in 20 minutes. Private Geddes emphasized the heroism of the nurses. One of his companions, [seen] later, paid a tribute to Geddes’ ready help and his refusal to leave the ship until the last possible moment. Sapper L.J. Kavanagh[v] of Kingston, 6th Field Engineers, invalided home after pneumonia, was in the water  minutes, but suffered not ill effects. Pte. W.L. Callander[vi] of Guelph, 18th Battalion, received a slight injury from wreckage while he was in the water  minutes. Pte. H. Bryant[vii] of Toronto, 4th Battalion, suffered from rheumatism, who stayed behind on the ship looking for his pay book, finally slid down a rope when the vessel tilted. Pte. William Everett[viii], of Galt, 1st Battalion, wounded by shrapnel in a bombardment, jumped into the seas remaining half an hour before being picked up by a destroyer. Pte. F. [Black][ix], of Toronto, Divisional Supply Column, suffering from rupture, swam 25 minutes before rescue came. Sergt. Robert Strang[x], of Winnipeg with relatives in Hamilton, had a narrow escape while swimming near the propeller. He and others were concerned that the ship was torpedoed, not mined. He saw a big hole in a staircase where a nurse lay dead. The few belongings with the men had were lost, but J.M. Clark, on behalf of the Ontario Government Agency, has visited all the Canadians and promised to supply their needs. A complete statement shows that [?] officers, one nurse and 120 soldiers from the ranks were lost. All of these except those described missing are believed to be drowned. One can imagine Private Geddes in fresh clothes, warm and secure, in contrast to the mud and water of Flanders, boarding the ship and sitting or lying down. Enjoying a cigarette, he feels the low rumble of the ship’s triple expansion 4 crank engines as the propellers began to turn and move the ship sleekly out of the harbour at Boulogne towards Folkestone. He relaxed and, perhaps, chatted to other soldiers, congregating with other Canadians and discussing what their next place of treatment would be like. It was a short trip and the vibration and warmth of the ship made Private Geddes relax and think of home and his next-of-kin living at St. Thomas, Ontario or Miss Edith Smith of Redhill, Surrey, to which he had assigned two-thirds of his pay ($20.00) per month. These reveries were about to be interrupted and the lives of the men and women on the ship would change forever. Unbeknownst to the crew and passengers of the Anglia, the German U-Boat UC-5 had sown a series of four underwater mines near the Folkestone Gate lightship on the night of November 16/17. One of these mines was struck buy the ship and it went down by its head and sunk within 20 minutes. H.M.H.S. [xi] Anglia started out as a passenger ship entering service April 13, 1900. When the war broke out she was initially converted to an “armed boarding steamer” but this role lasted until late in 1915 when she was converted to a hospital ship, one of 91 ships to be in service in this role. She was the first hospital ship to be lost to enemy action and its loss was a shock to the British public. Their awareness of this ship had been enhanced by it being recently used by the King to convey him from France to England after a riding accident on October 29, 1915[xii]. Private Geddes, along with others in the article respond to the disaster as best they could. They were lucky as they were to survive while 164 people are thought to have died. [xiii] Of the dead, 23 of them where Canadian soldiers, including two members of the 18th Battalion, Privates G.E. Knight[xiv] and T. Priestly[xv]. A third member of the Battalion, Private W.L. Callander[xvi], was to survive the sinking. It is interesting to note that of the six men in the article, only one was suffering from wounds due to service (Private William Everett). All the other men were experiencing illnesses exacerbated by their exposure in the trenches. But the sinking had some far reaching effects to some of the men in the news article. Of the men listed Geddes, Kavanagh, and Strang suffered from neurasthenia/nervous shock as a direct result of their exposure to the events of the sinking. As is stated, ironically by Private Geddes, “German shells and bullets in the dugouts, and trenches are bad enough but for real nerve-wracking horror a mined hospital ship beats everything else.” This sentiment was also reflected in a letter from another survivor. Private Peter E. Wamsley[xvii][xviii] wrote, in a letter published in a newspaper, “I have been under rifle fire and shell fire, I’ve been shipwrecked twice in one day. I thought, ‘Now (Mr. Fritz), a few bombs from an aeroplane on this train, then we shall have had what some folks might call a ‘rather rough passage.’”[xix] Both these men suggest, by their words, that they would have accepted any fate that front-line service presented but to be subject to enemy action having obtained non-combatant status as a wounded or ill soldier was not exactly fair play. This news clipping relates the events that had were unique. The H.M.H.S Anglia was the first hospital ship to be lost in action and its loss illustrates the changing face of an industrial modern war. Now, the depth and reach of the enemy was greater than wars before. The use of U-Boats, aeroplanes, and Zeppelins by the Germans, and the equivalent devices of war by all combatant nations, extended the reach of weapons and impacted the soldiers, and civilians at the home front. The risks and horror of war did not end at a front-line as that area now had a depth to it equivalent to the striking distance of the weapons available to the enemy. Even with this ships status as protected under the Geneva Conventions, the indiscriminate and random nature of a sea mine prevented any intervention by German command authority to prevent this ship’s destruction. The personal cost to the Canadian Forces and the family members was evident by the 23 Canadian soldiers who drowned during the sinking and that sinking directly affected the mental health of survivors, as represented by the men whose service records reflect them suffering psychological effects from the sinking, as documented in their service records. It also shows that the medical services had to contend with a wide range of medical conditions, with many cases of wastage being due to illness and not due to direct enemy action resulting in wounding. The position of the H.M.H.S. Anlgia in relation to its destination. The H.M.H.S. Anglia lies at the bottom of the Channel, a stark, but less known part of a Canadian military heritage during the First World War. Three men of the 18th were directly affected and the Galt Daily Reporter found a connection with Galt and its residents that it found news-worthy. Private Percy Mungo Geddes, a flour miller, late of Galt, Ontario was noteworthy enough to have this article written about him even though he was not a resident of Galt at the time of his enlistment. [i] For a good overview of the American Army system of casualty evacuation and care see this link. It is very similar to the Imperial system. See this link for the Imperial system. [iii] Galt Daily Reporter. November 29, 1915. Page 5. [iv] Private Geddes, Peter Mungo, reg. no. 1435. 8th Battalion (Winnipeg Rifles), CEF. [v] Sapper Kavanaugh, Leo James, reg. no. 575. 6th Field Company, 2nd Canadian Divisional Engineers, CEF. [vi] Private Callander, Wilfred Laurie, reg. no. 53640. 18th Battalion, CEF. [vii] Private Bryant, Horace, reg. no. 10625. 4th Battalion, CEF. [x] Sergeant Strang, Robert, reg. no. 14808. 6th Battalion, CEF. [xi] His or Her Majesty’s Hospital Ship. [xiii] 1 Nursing Sister, 9 R.A.M.C. Staff, 4 Army Officers, 125 Other Ranks and 25 Crew. [xiv] Knight, George Ebenezer: Service no. 53350. [xv] Priestley, Trueman: Service no. 53840. [xvi] Callander, Wilfred Laurier: Service no. 53640. [xviii] Note that this soldier not only had to escape from the Anglia, but the he claims that the “Lusitania”, a former collier (not the passenger liner of the same name), had been hit by a torpedo. It is more likely from one of the mines the SM UC-5 lay. [xix] Craven Herald. November 26, 1915.